Like many gourmet foods, high-quality chocolate takes time to produce. Between the time when the beans are harvested from the tree, and the time when they are processed into chocolate, they undergo a vital fermentation process. It is this fermentation stage that gives artisan chocolate, such as our chocolate treats from Hawaii, its deep and luxurious flavors. One of the many reasons we use chocolate from Guittard for all of our delicious chocolate covered nuts and coffee beans is the care they take in selecting cacao beans for their chocolate that have been properly fermented. Proper cocoa fermentation is absolutely essential for developing the complex flavors that chocolate lovers crave. Cocoa fermentation removes the tannins in the cacao bean. 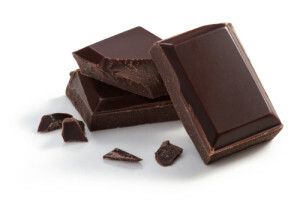 These tannins are responsible for the bitterness you often detect in lower-quality chocolates such as those made in Mexico and Central America. When they are first picked, the cacao beans contain about 10% tannins. These bitter compounds dissipate as the beans ferment, yielding a much milder chocolate. Other processes, in addition to tannin removal, also occur during fermentation. Other compounds in the chocolate are oxidized, which changes their flavors and adds subtle nuances to the chocolate. To begin the fermentation process, the farmers remove the coffee beans from their pods, using care not to damage them. These fresh beans, which have a sticky coating, are placed in a sweatbox and allowed to ferment as yeasts settle on the beans and break down sugar into alcohol and carbon dioxide. Bacteria called Mycoderma aceti then break down the alcohol even further. The high temperature in the sweatboxes speeds the fermentation process along. After about 5 – 7 days, the beans are ready to be turned into chocolate. For delicious chocolate treats from Hawaii, made from carefully fermented beans, check out Hawaii’s Local Buzz.